Our Double Smoked Bacon has been rendered of its fat, but retains its fully smoked flavor, making this a refreshing, flavourful salad that will please your cravings and ease your mind. 1. Pre-heat oven to 350 F ( 175 degrees C). 2. Remove the rind from the Double Smoked Bacon. Slice the bacon in half, place it on a baking tray lined with parchment paper and bake for approximately 20 minutes, or until golden brown and crisp. A lot of moisture will melt away from the bacon, which will also be a good indicator. Keep in mind that the bacon will be more brittle once it cools. 1. Quinoa can be cooked the same way as rice, with a one-to-one ratio of water to quinoa. Boil the quinoa for 10-12 minutes, then check the texture; strain the water, and lay the quinoa on a baking tray to cool it down without overcooking. 1. In a blender or food processor, pulse the basil and olive oil until it reaches a pesto-like consistency. You can also add more oil to make it more of a basil oil. 1. Cut the avocado in half all the way around the pit and twist to separate the two halves. Scoop the flesh out with a spoon, starting at the edges of the skin or place the avocado facedown on a board and peel the skin off carefully. Slice each half into 5 wedges, then season them with salt and squeeze some lime on top to prevent oxidization (the lime also adds flavour and acidic balance to the creamy avocado). 2. Cut the cherries in half and remove their pits, then toss the cherries in the balsamic vinegar and a drizzle of olive oil. 3. Lay a bed of arugula on the plate. Toss the quinoa in the bowl with the balsamic cherries and season with salt and pepper, then plate it on top of the arugula. 4. 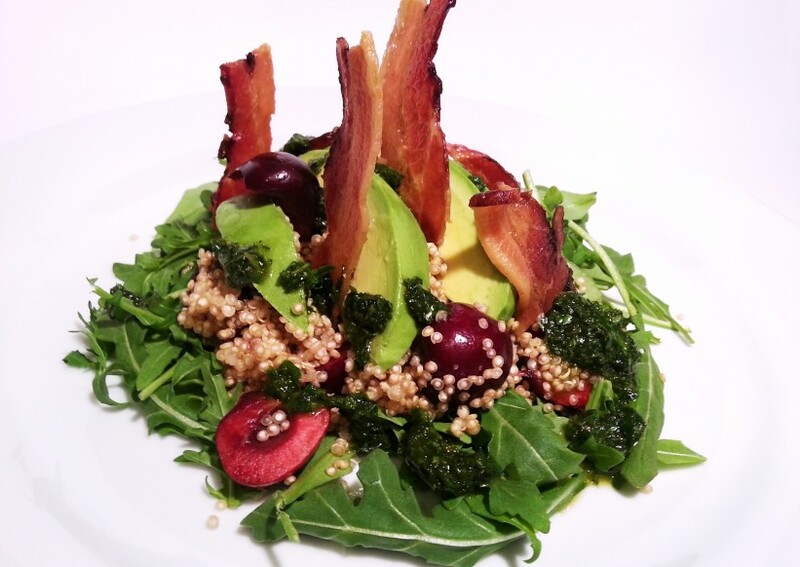 Fan out the avocado wedges over the quinoa and arrange the bacon to look like shards poking out of the salad. Drizzle the salad with basil pesto and sprinkle on some salt to finish.